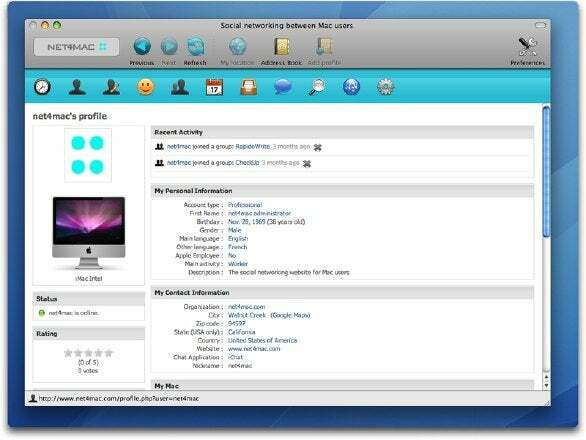 Net4mac is a new free social networking networking service developed especially for Mac users. In fact, you need to download a Mac application in order to get it to work. Net4mac lets users create profiles, contact other members and send invitations to the community, create and join interest groups, create specific events and invite other Mac users and search member profiles for different criteria. The application that drives net4mac lets you access the community from your Dock and see the number of messages you have there, send invitations using your Address Book, add pictures from your iSight camera and more. Net4mac is free to use. The software requires Mac OS X v10.4 or later.